Happy Monday and WELCOME to the Elisalex Dress Sewalong!! We've been totally psyched about this ever since we wrapped up the Charlotte Skirt Sewalong... Choosing fabrics, thinking up exciting variations and seeing all of your tweets and instagrams as you prepare to sewalong has only upped the hype for us! Heads up: Elisalex Dress Sewalong coming in March! We really want to make this sewalong even better than the last, and accessible to all sewing abilities (our only requirements are that you can thread your machine and sew a basic cushion cover first! ), so please get in touch via the comments below or tweet us with any questions or extras you'd like us to cover. The secret to clothes that look and feel amazing is all in the fit. If something does not fit your body well, chances are it won’t feel great to wear. And if you don’t feel great, what’s the point?? It is important to remember that sewing patterns, just like shop bought clothes, are sized and graded to a set of average measurements. However, once you have a solid understanding of your own shape, it is pretty simple to adjust a paper pattern to your own unique proportions. 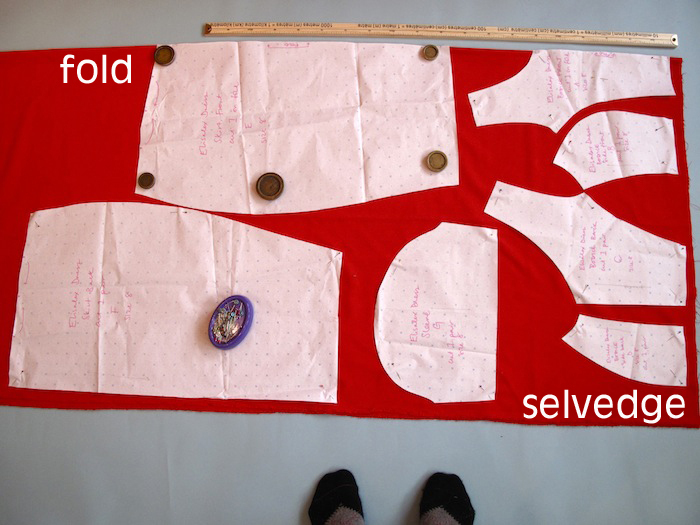 Using a measuring tape and the diagram below as a visual guide, note down your waist and bust measurements. For this dress with its exaggerated tulip skirt, it's not necessary to take a hip measurement. Your waist is (usually) the smallest part of your torso, in between your ribs and hip bone. This is where the dress' waistline will sit. Your bust measurement should be taken around the fullest part of your chest, preferably while you're wearing the same type of bra you would choose to wear under this dress. 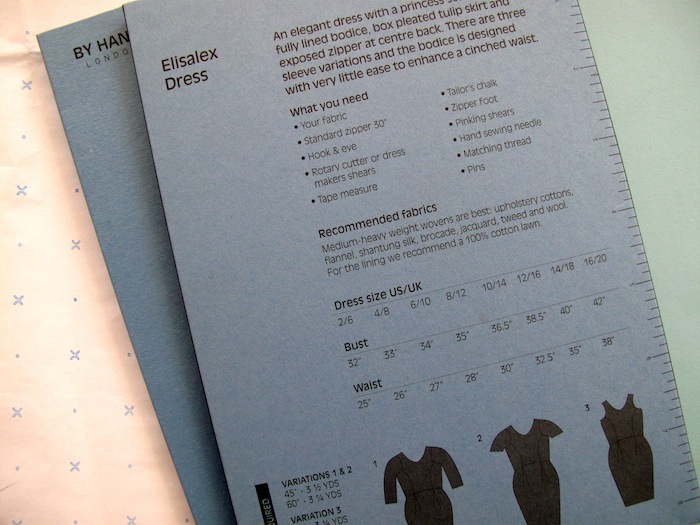 First, compare your waist measurement with our sizing chart on the back of your Elisalex Dress pattern. This pattern has been designed with very little ease, ie. 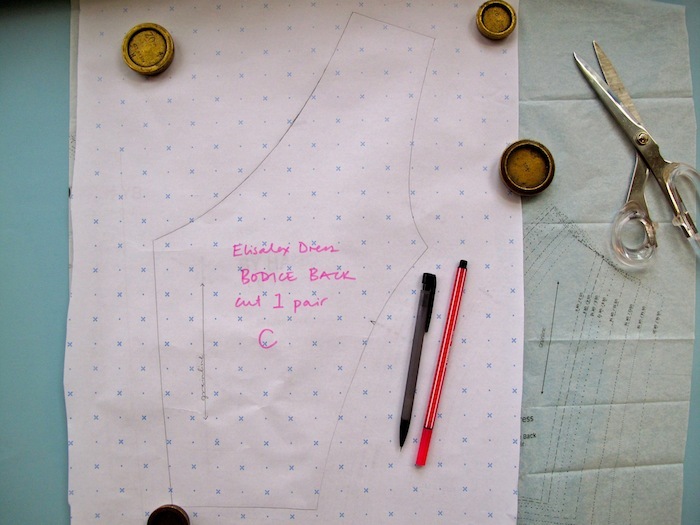 it is designed to be very form fitting at the bodice, so take the sizing chart as the finished garment measurements. Don’t worry if your measurements don’t match our sizes exactly, we’ll be showing you how to adjust the pattern if your waist and bust measurements fall into different “sizes”. For now, use your waist measurement to determine your size. 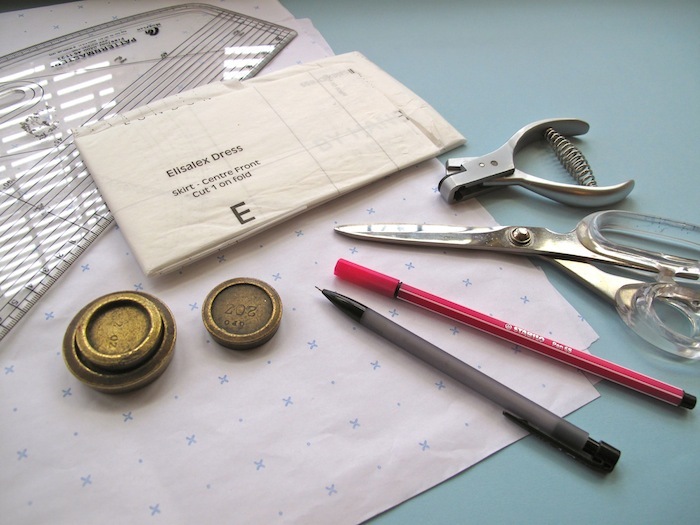 Use pattern weights (or anything heavy) to keep your tracing paper in place. Trace off your chosen size, using a ruler and specialist curves wherever possible, copying all markings and notches. Label each pattern piece clearly (don't forget to include the size you've cut - like we have!!). Carefully cut out your pattern pieces. This is a debate that divides many sewists... A toile, or a muslin as it's usually called in the States, is basically just a practice run of the garment you are making in a cheaper fabric. Any changes to the fit or style of the pattern can then be made to the toile without having to tweak and potentially ruin the actual fabric you've chosen for your final garment. Time consuming, yes, but definitely worth it if you want a perfect fit. As a general rule, if you answer "yes" to any of the following questions, we definitely advise that you first make a toile to be on the safe side. We wouldn't want you spending all that time only to waste your precious fabric! Do your measurements differ wildly from our sizing chart? Is there a difference of more than two sizes between your bust and waist measurements? Do you have some ridiculously expensive/irreplaceable/vintage fabric lined up to make this dress? Have you chosen to make your Elisalex Dress from a fabric with more stretch than the fabrics we've recommended, like jersey? To make a toile, choose a cheap fabric with a similar weight and drape to your main fabric. You may as well choose a fabric in a colour or print that's not too hideous so if it turns out alright, bonus! You'll have an extra dress! This is called 'a wearable toile/muslin'. If it's only the bodice you want to toile, don't worry about making the whole dress, or even bothering to line it - just make the outside of the bodice up in your toile fabric, check the fit, make any adjustments (we'll be going through some common adjustments later) and then move onto your main fabric once you're happy. Fold your - pre-washed and freshly ironed - fabric in half lengthways and lay out your pattern pieces on top. Pattern placement is a bit like a puzzle; you have to try to get the most out of your fabric, while keeping to the grainline and nap*. On our layplan above, we've got a 60" wide length of fabric folded in half lengthways. You'll see that we've got the bodice front and skirt front placed on the fold, we've gone for a short sleeve and shortened the skirt to 24" - the perfect just-below-the-length! Feel free to shorten or lengthen the sleeve and skirt to your own taste; sleeve and skirt length shown on the pattern is just a guide, given that our heights, arm lengths and preferences vary so much. Secure your pattern pieces carefully into place with either pins or weights - it is entirely up to you to find the cutting method you're happiest with. Even here at By Hand HQ, we're divided! Victoria insists upon pins and super sharp shears (fabric scissors), while Elisalex prefers weights, a cutting mat and a rotary cutter. Now cut around all the pattern pieces, being sure to snip all notches. Repeat this for the bodice lining. Phew! Any more social media to include? Don't think we've got quite enough there...! Grainline - the threads which run lengthwise on woven fabrics, also known as the 'warp'. The grainline lies parallel to the selvedges. The opposite of the grainline is the crossgrain, which runs widthways from one selvedge to the other. Nap - a term used for fabric that has a directional pile like velvet, suede, terry cloth, corduroy etc. When you brush over it with your hand in different directions, it will appear slightly different as it reflects the light. 'Nap' can also refer to fabrics with a directional print such as stripes, chevrons or damask. You need to make sure your pattern pieces all face the same direction so as not to end up with a strangely optical effect! Thanks so much for the help. I’ll need to make a trip to Macculloch and Wallis after work on Thursday then. A post on zippers for the Reversalex would be ace! Thanks. i am used to sew German patterns which doesn’t include seam allowance. somehow i feel it fits better when i cut and mark exact seam line on the fabric. so i am going to delete seam allowance from pattern and mark seam line. it’s just my personal sewing habit. i shortened skirt now. 24" is just good for me too. thanks. I’m sewing Elizalex and I think it’s clearly a beautiful pattern and you look gorgeous in it. Can I ask how tall are you? I’m quite rusty at the sewing – my mum taught me when I was growing up as she made all our clothes. She wasn’t around when I was laying the pattern. I did think to allow extra length in the body as I’m 5’9" and i constantly have problems in the shops with lovely dresses being too short in the body and me ending up looking like i’m trying on clothes for a 12 year old! What i didn’t remember was to add extra length in the straps too so I’m making an extra piece for the shoulder (of course I cut it all and basted it together and then realised when the neckline was very high compared to the photos on the website!) I’m thinking that in the future you could consider adding a reminder to the instructions for different heights along with the dress sizes in the size guide? Or even a height allowance option in the pattern itself, just as you’ve included the seam allowance? It’s going to be a gorgeous dress and I really love what you’ve done with the pattern but just thought it might be a helpful share. Thanks and I can’t wait to finish the dress and then start on the skirt or jacket too! arrgh please tell me it includes seam allowances?! I’ve got 2 related, and probably equally silly, questions about making the Reversalex version. I’ve never made anything reversible before so have no idea how this will work! 1. What colour thread do I use when the two fabrics I’m using are different colours? I’ve got green on one side and bright pink on the other. 2. The zip – would you use an invisible zip or a normal zip for the reversalex, or can you use either? I haven’t bought a zip yet and wasn’t sure which type to get, or which colour again. The pattern definitely does include seam allowance! 5/8 of an inch // 15mm. And yes, shortening from the hem line is fine – I’ve shortened mine for the sewalong by simply chopping it at 24". Yes yes yes the pattern DOES include seam allowance!! 5/8" or 15mm. 1. When making the Reversalex, the thread in your needle will need to match the top fabric (imagine the top as you are feeding it through your machine), and the thread in your bobbin will need to match the bottom fabric. Might have to do a quickie post on zippers for the Reversalex!! Finally chose a fabric today, and already toiled the bodice, so looking forward to starting! Oooooh silk organza underlining honey that sounds delicious!! As long as it’s sturdier than quilting cotton and underlined that should be fine. Just make sure you assemble the box pleats with the cotton and organza together as one to give it some stiffness… Sounds amazing already! I am tracing pattern right now. two questions from me. 1. this pattern doesn’t include seam allowance. right? 2. I need to shorten skirt quite much. shall i shorten simply from hem line? or where is the desirable point for shortening skirt lenght? I’ll be way behind. Because I am going to make a muslin this time. I think I’m going to try the FBA too! (my first-I’ve mostly been sewing with knits because of this! )I found so many perfect fabrics for this dress that as soon as I get the muslin sorted, I’ll be making the reversalex! I want it now! I’m so excited! I do have a quick question though. The fabric that I bought is considered home dec fabric, but it’s much thinner than the other upholstery fabrics I looked at. It’s 100% cotton and slightly heavier than your usual cotton apparel fabric, but not by much. Do you think underlining it with silk organza would give it the appropriate hand for the skirt? I’m so excited about this! I can’t make it right now but I’ll be coming back to this soon! Yay! Can’t wait to get started! Got my fabric this weekend!